This is the safest place to start, with people and dogs you’re already comfortable with. Invite family or friends and their dogs over for a fun get-together or offer to watch their dog for the day so the pups can play together. Obedience training and puppy preschool type classes both offer the opportunity to meet fellow dog owners that might also be interested in doing more socialization outside of the class. Don’t be shy, connect with the other dog owners or ask the instructor to make a formal announcement for you. You know those co-workers with pictures of their dogs on their desks or the ones that talk constantly about their pooches? Ask them to participate in an after work playdate. Bonus: You’ll get to know each other better and you can work as a group with management to seek support for the annual Take Your Dog to Work Day or create a dog friendly workspace. Getting to know your neighbors is always a good thing. Start up a short conversation the next time you see someone walking their dog. They might also be interested in getting together for a playdate or scheduling times when you can walk your dogs together. Maybe you’ve met someone at the dog park whose dog is also overwhelmed and they would like a more relaxed environment for their dog. Perhaps your dog has made some good friends at the park, but newcomers are too rowdy and the dynamics of the park have changed. Both are opportunities to connect elsewhere for a playdate. Some vets support dog owners by keeping lists or bulletin board notices of dog owners looking to connect for a variety of reasons. Check with the receptionist on your way out to see if they have any suggestions or recommendations. Dog trainers work with clients that are highly motivated to socialize their dogs. Trainers also are well equipped to make suitable recommendations based on the temperament of the dogs they’re working with. 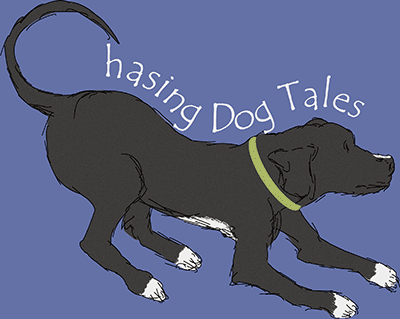 Talk to a local dog trainer that supports positive reinforcement training for recommendations. Groomers may have clients that are looking for playdates and they can also recommend dogs that are easy going and get along well with other dogs. Attend some local dog related activities, such as group dog walks and festivals. People love to talk about their dogs, so don’t be afraid to ask questions and get to know people. Some helpful apps are: Dogways, Meet My Dog, DoggieBnB, Sniffr and Dogdate. Websites and apps come and go, so keep checking for new ones to help you network with dog people. Talk to your vet about the best way to socialize young puppies that aren’t fully vaccinated. Since the ideal age for socializing a puppy ends somewhere around 16 weeks, you’ll need to ensure your puppy only socializes with healthy dogs. Socialize dogs with similar temperaments, energy levels and play styles. Also consider the size of the dogs. Large energetic dogs could injure small dogs or puppies. Only provide dogs toys if none of the dogs have guarding issues. Meet for the first time in neutral territory. Choose a safe, fenced-in area that’s not too large in size so you can easily get to the dogs if necessary. Keep the first meeting and interaction calm. 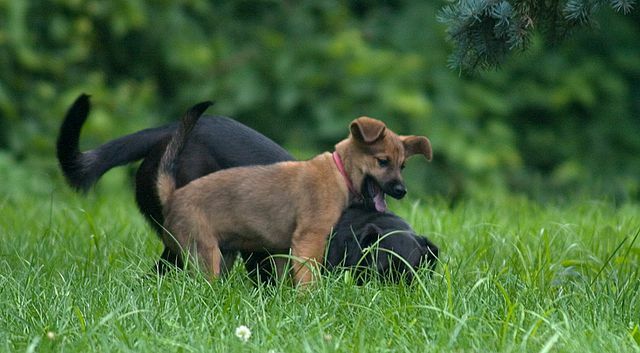 Allow the dogs to sniff each other for a moment, then take them for a short walk together before letting them off-leash. Watch each dog’s body language and be prepared to intervene if the dogs become tense. Read 15 Helpful Dog Parks Tips to learn more about what behavior to watch for. Call each dog away occasionally for short breaks and separate the dogs if things aren’t going well. If your dog’s not having fun with the other dogs, try again later with a new group of dogs. Don’t force the dogs to interact. Allow them to greet and play on their own terms. Some dogs prefer not to play with other dogs at all, and that’s okay. Always provide lots of water and ensure the dogs have occasional breaks in a shady area if it’s hot outside. Follow your instincts. Don’t agree to a playdate if you don’t feel completely comfortable with the other dogs. It’s okay to say “no”. Playdates should be a positive experience for all of the dogs. If your dog is aggressive or extremely fearful, work with a qualified trainer to help your dog overcome these issues before attempting to set up a playdate. Playdates can be valuable for a dog’s physical and mental well-being. It’s an excellent way for them to release excess energy, exercise and learn a few doggie manners from each other as they socialize. 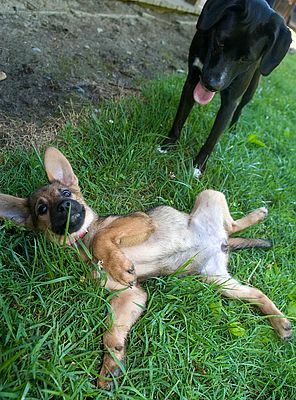 If your dog is mostly isolated from other dogs or usually only interacts with family members, think about setting up a playdate soon. Have you tried doggie playdates? 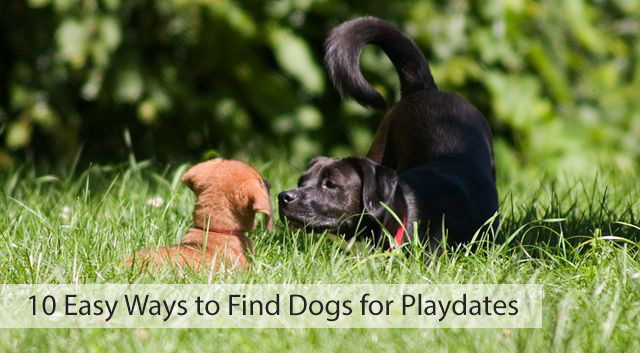 What was your best way to find dogs for playdates? Great post! I love doggie play dates! Great to keep our pups socialized! Hi Jenna! Your Huskies are welcome anytime at our place for a playdate! Great suggestions here – socialization is so important for dog’s health and well-being. Playdates are the best. I was very thankful that a board member at my job invited me to bring Honey for a playdate with her golden doodle. It was Honey’s first playdate and the first of many that made her so good with strange dogs. That’s great, a co-worker canine connection! I wish more companies would promote pet activities or dog-friendly work spaces. Great post, Elaine. I especially like your suggestions to have the dogs meet for the first time in neutral territory and to take them for a short walk together before letting them off-leash. I’d like to find some friendly large dogs for play dates with my dog Savanna. Savanna would probably love that. Goldens seem to be such easy going dogs, I haven’t met one yet that didn’t get along well with other dogs. Great ideas! We don’t go to the dog park any more (long story) and only do play dates. Rita plays with dogs that are “family” and that we met at the dog park, back when we used to still go! It seems like most dog owners have one of those “long stories” about something that happened at the dog park. They work for some people and dogs, but I prefer playdates for Haley too. Family playdates are the best, since the dogs usually know each other pretty well and it gives you a chance to catch up and hang out with family. Great tips. Our training facility used to have drop in play groups on Sunday mornings. We would bring Sampson (and our coffee) and just hang out and chat while the other dogs played. They charged something like $10 for a 45 minute session and it worked out great! That sounds like the perfect Sunday morning, sipping some coffee and watching the pups plays together. Definitely would be worth 10 bucks. Love the idea about getting together with co-workers to promote Take Your Dog to Work Day! I think some businesses would be open to it if they knew a good number of their employees would appreciate it. It’s definitely not suitable for all workplaces, but it would be wonderful for morale. Great suggestions ~ I really liked all the websites & apps you mentioned! Thanks Barbara, I’m so thankful for all those wise, teaching dogs too. It’s so interesting watching the interactions when lessons are being taught, huh? Mila and Muki sound like best friends! I agree that family dogs make the best playmates and playdates. We think this is so cute, and we love the photos! Playdates are lovely! Be sure to visit us some time! Yes, I’m ready to schedule more playdates now that it’s getting warmer outside. Glad you stopped by today. Heading over to check out your blog now! hi,iam looking to connect with doggy play dates,i have a Maltese x Shi-tzu puppy,4 mths old,very playful but i would love to socialise with other dogs his size. Your puppy sounds adorable and it’s awesome you’re wanting to socialize him with other dogs. Try some of the ideas I mentioned in the post for locating people near you. Another idea is to start with a visit to a doggie daycare center where you can hang out and watch your dog while he plays and socializes. One more tip! Check for local dog events or festivals where you can meet other dogs. If all else fails, think about starting a community dog walk where you can meet some neighbors and their pups and set up some playdates from there. Good luck and have a great time! There really is a ton of fun to be had by finding dogs for playdates. We did go out many times with other dogs in the family when she was younger. Oh! Happy times. Sadly, my dog has reached old age and really does not have enough energy for this now. We are currently looking for a playdate for our Madeline. She is only about 6 pounds, 2 years old, and full of energy. I don’t know if you live near us. I am near Dauphin County PA.
Great article! Would love to have some playdates for my pup. Hershey is a 5 month Lab mix. Looking for Queens or L.I. It’s very important to socialize as much as possible.